I could say that words are important and that not Rai shut the mouths of political talk shows, but the People of Freedom did. 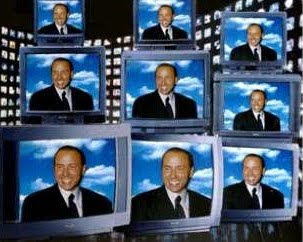 Because, if when the RAI Supervision Commission (Commissione di vigilanza) has decided to close political TV programs during the thirty days before regional elections the Democratic Party had left in protest, it means that the responsibility is all of the PDL, with the help the inevitable tightrope ‘Christian’ UDC. I could say that this is yet another example of the seriousness of the conflict of interest, since Berlusconi’s Mediaset will continue to transmit its political shows. I could say that it is really offensive to defend the PDL, stating that with near to Left talks shows like Annozero, even Centre Right friendly program, as Porta a Porta, will be closed, because the former has a TV share much larger than the latter. I could say this, but I will not, because it is obvious. The useless trivia - or perhaps much needed to someone - is already the prerogative of big media, in a transversal way. I will say another thing. That is, in my modest opinion, the closest to the truth. I will say that while the PDL will close Annozero, other voices will continue to speak in its favour. Not just on Mediaset, but on Rai. I could say that the first of all is the news program Tg1, but this would be a platitude in a blatant attempt to be authentic. The voices in favour of the People of Freedom are all those that whish to distract the audience and dope them with trash nonsense, that fill their heads with illusions and delusions, clearing it of propensity to self-improvement. True gems of the State television, as La prova del cuoco (Ready Steady Cook), Ballando con le stelle (Dancing with the stars) and I raccomandati (The recommended). I will stop here, although the list is still long. Someone, I think showing considerable ingenuity, might respond by reminding me that these are not political TV programs, ignoring a fundamental fact: the leader of the PDL didn’t come from politics but from the television world. Commercial television, to be precise. The TV that sells anything to keep people glued to their screens. Everything and more, as the Rai motto says. The News: Rai will close political talk shows thirty days before the Elections.